Morgan Heritage’s last album, Strictly Roots, won the 2015 Grammy Award for Best Reggae Album, a tough prize to take in a category usually dominated by the Marley dynasty. Like the Marleys, Morgan Heritage is comprised of a group of siblings fathered by reggae artist Denroy Morgan, who managed to crack American dance and soul charts in 1981 with a disco tune called I’ll Do Anything For You. Morgan moved to the United States from Jamaica when he was 19 years old and his children, who were to become Morgan Heritage, were all born in Brooklyn, putting them in a unique position, like their father, to straddle two different musical worlds - one American, and one Jamaican. This blending of influences can be seen as early as 1994 on the first album, Miracles, as influenced by gospel, R&B, and hip hop as it was by reggae. Even the more recent Grammy winner, Strictly Roots, strays from its name by featuring a dubstep tune - a more contemporary influence that the Morgans have relatively recently worked into their repertoire. Morgan Heritage has demonstrated throughout their twenty-three years that they are the most well-rounded and dynamic musical family in reggae and that they are worthy of sharing the throne with the house of Marley. 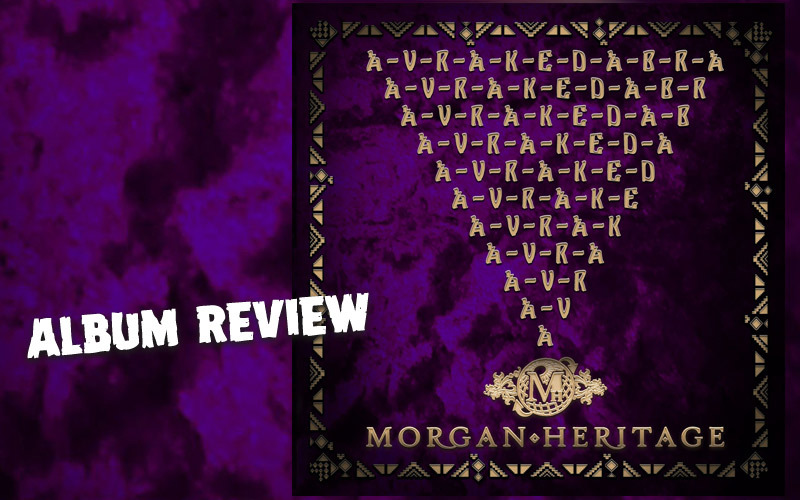 If there were any tension between the Marley and Morgan progeny, listeners of Morgan Heritage’s newest album, Avrakedabra, would be hard pressed to detect it. The album includes a piano-driven track called One Family that features two fellow Grammy winners, Stephen and Ziggy Marley. At times reminiscent of Bill Withers’ Lean On Me, One Family is beachy, grown folks’ reggae-funk, with a nasty four-bar mix up dashed halfway into Stephen Marley’s verse. Those sixteen beats are nice, but not worth enduring the first two and a half stale minutes. Reggae fans will find their time better invested in Selah, a mean culture song with joyful Rastafarian lyrics that describes the connection between music and spirit. Selah’s straightforward culture vibe comes directly from the most successful page in the Morgan Heritage playbook - a familiar comfort in the middle of what is otherwise a pop-reggae experiment. Avrakedabra is infused with many shades of reggae fusions and, because of Morgan Heritage’s skills as musicians, all of these blends are, at minimum, well executed. The group’s biggest offense are those songs on the album that seem created for immediate export - like the Jimmy Buffet-esque Pineapple Wine or Dancing in the Moonlight, which appears to have been plucked directly from one of the many cruise ships in the Caribbean Sea. Beyond this momentary pandering to the tourist market, the Morgans are talented facilitators, and some of their most radical experiments produce results. We Are has a bouncy, futuristic feel reminiscent of Dave Kelly’s classic Joy Ride Riddim… if Skrillex relicked it. The tune features two artists, Dre Island and Kabaka Pyramid, who represent the future of reggae music, and the repetitive hook aptly declares, We are the future! This combination of artists is magnificent and everybody delivers in top form, bringing organic authenticity to the proposed future format. It’s apparent that the Grammy win has opened a new chapter in Morgan Heritage’s career, and the new focus seems to be on maintaining longevity as opposed to the old focus of making their mark. They’ve now certainly made an undeniable impact on both the reggae scene and the broader global music market. They continue to branch out to new fans by hitting the festival circuit hard every summer and Avrakedabra feels like an attempt to reach out to those who may be new to Morgan Heritage’s music. There’s a few morsels tucked in there for the true fans, but the presence of influences as far ranging as country to EDM seems purposed with reeling in both festival bros and Grammy geeks. It’s a solid strategy. In the age of digital media, live performances are where musicians make their money, and those bros and geeks will be lining up to see Morgan Heritage play for decades to come.